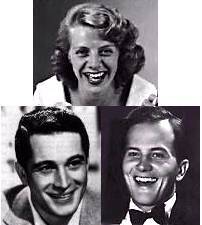 1950s Music – 1950 -1954 consisted of light melodies, sweet lyrics, wholesome singers. Innocent and inoffensive songs. All of this can be said about the music of the Early 50s. Yet, all that white American complacency could not hold back the vitality of Black R&B music, so a whole new sound emerged – Rock and Roll. 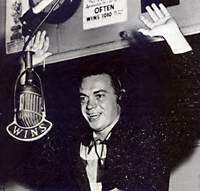 About this time, a Cleveland DJ named Alan Freed (Rock and Roll Hall of Fame inductee, 1986) began playing Black R&B tunes. 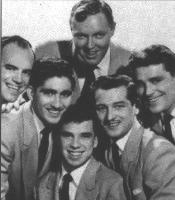 Freed moved his show to New York in 1954 and began including live performances, especially of the artists with the vocal harmonies he favored. His called this sound Rock and Roll. 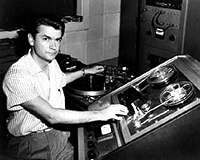 Fittingly, he is the first Rock DJ. And many consider his Moondog Coronation Ball, held March 21st, 1952 in Cleveland, to be the very birthdate of Rock and Roll. Although gaining in popularity, these black artists originally did not sell as well as their white contemporaries, who had rerecorded the same songs as what is known as a “cover version.” If you have ever heard Pat Boone’s “cover” of Tutti Frutti you will understand why, thankfully, this practice of having whites “cover” black artists wasn’t long-lived. Chicago, two brothers, Phil and Leonard Chess (Rock and Roll Hall of Fame inductee, 1987) took the best of the black bluesmen performing in their nightclub and began recording them on their Chess label. Chess Records, a storefront on Cottage Avenue in the “Little Mississippi” area of Chicago, was already home to the great Muddy Waters. Still, what both Phillps and the Chess brothers needed was a crossover artist – someone who had the energy of Rhythm and Blues and the marketability of say, Pat Boone. Someone who could sell records. Phillips found just such an artist – Elvis Presley. And the Chess Brothers, well, they found Chuck Berry. These diverse factors influenced the music of the Early Fifties. The bubblegum sweetness would eventually fade away, like the blush of America’s post war optimism. Whereas Rock and Roll, with its irrepressible energy – well, Rock and Roll was here to stay.